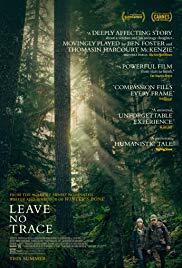 After the indelible Winter's Bone, filmmaker Debra Granik carries on exploring connections between people and nature in this strikingly visceral drama set in the Pacific Northwest. As it expands to touch on a variety of timely themes, the film maintains its tight focus on the central father and daughter, played beautifully by Ben Foster and newcomer Thomasin McKenzie. It's a provocative film that reaches deep to evoke a powerfully emotional response. Still suffering from post-traumatic stress as a war veteran and widower, Will has taken his 13-year-old daughter Tom to live in the national park outside Portland, teaching her survival skills. But she's not so quick to pick up on his restless spirit and innate urge to avoid civilisation. So when social services take them in, she adapts much more quickly than he does. On the run again in the forests of southern Washington, they encounter a kind of drop-out community led by Dale that might meet both of their needs. Granik crafts this narrative into an involving, unpredictable odyssey as this father and daughter navigate the seemingly erratic rules of society as well as the changing connection between them. Refreshingly, there's no artificial conflict. Social workers and strangers compassionately try to understand their specific needs. So there's never a false moment in which a plot point threatens to spin the story into melodrama. Instead, the film locks in on this close but tricky relationship between a troubled man and a girl who's just discovering who she is. Both actors deliver earthy, transparent performances. Foster seems to crawl back inside himself as Will, a man flinching away from the world but aware of his responsibility to this young woman who has no memory of her mother. He has taught her to think for herself and be independent, even as he worries for her safety. And McKenzie gives a superbly layered break-out turn as a teenager whose mind is too sharp not to question everything around her. The most powerful moments have virtually no dialog, expressed in quiet glances or drilling stares. This confident filmmaking shows in every frame, beautifully shot by cinematographer Michael McDonough to create an almost otherworldly atmosphere in damp, cold, lushly verdant landscapes. Yes, there's a fairy tale tone here, and Granik picks up the story just when the people think they've found their happy ever after. What they discover instead is something much more complex, tough and honest.